New Columbia Heights: Getting a parking ticket for an expired sticker... and an up to date sticker. Getting a parking ticket for an expired sticker... and an up to date sticker. I received this morning a peculiar ticket on my car, after living in the neighborhood for 22 years, currently on Monroe Street, I have never thought that this was an official "ticketable offense". Maybe the powers that be in city government be need to make up for some cash for a certain expense for a duo of leased SUVs. I received a ticket "Expired Sticker". Yes there is an expired sticker on my car, RIGHT NEXT TO A VALID STICKER. Had I had a sharp razor at the time when applying the new sticker I most certainly would have removed the old one, but I did not. So I left it, like many other cars do in the neighborhood - you know the ones that have 5 and 6 parking stickers growing up the side of the windshield to either prove they are long-time residents or trying to make their car less appealing for stealing. Anybody else get similarly ridiculous tickets? 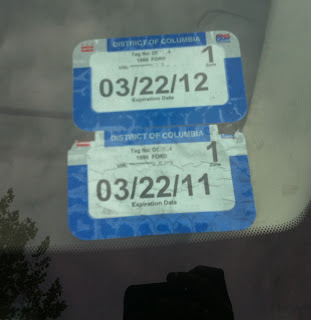 Below are the stickers and the ticket, which is for "failure to remove expired sticker." Common sense is not so common with the ticketing folk... if they can raise a quick buck on anything they will. oh and at least yours was only for $25 - I had the same one and it was for $100! I got one of these recently too! The DMV also sent me a "Vehicle Registration Renewal Confirmation" that stated: "When you receive your new vehicle registration certificate and window sticker, you may remove the old window sticker..."
That didn't make me think that I was obliged to remove it! And yes - there are many cars in the neighborhood with multiple stickers, and I never see them receiving tickets. Not that I think they should... it just makes me wonder why we are being picked on...? sorry, no sympathy. you're supposed to remove the old sticker. if you didn't have any money and you parked at a meter, you're going to get a ticket. you run risks, and you got busted. just because other people in the neighborhood don't do the sticker thing right doesn't mean you should expect a free pass. pay up. thanks for helping fill the budget gap, and hope you've learned your lesson. Yup, I got the same ticket: $15. Problem is, those stickers are nearly impossible to remove. I just left the old sticker until next time I visited the inspection station, then asked one of the guys there to scrape it off. Looks like the newer stickers are a bit easier to remove. You don't need a razor to remove the stickers. The trick is to take a pair of scissors and, using the tip, cut a "t" in the back of the sticker. The adhesive is only around the border, so it's pretty easy to get it off by peeling from the middle. Then it's not the end of the world if you can't get the entire thing off. Just lay the new sticker on the outline of the last. has anyone ever asked WHY this is a ticketable offense? For the life of me I can't imagine a rationale for this. Been on the books and that it's a "safety" issue, cutting off visibility. That they're rolling this out now smells of oppotunities for increased revenue stream. yes, got one last night on 14th above U street. i was parked at a paid meter, and furthermore have a current sticker affixed adjacent (not above) to the old one. i'm going to contest this. first, they don't make it clear what the violation is actually for (RPP FAIL REM EXP STK? wtf? i had to find this blog to learn just what the hell that was), and second i'm going to ask them to provide proof of violation of an *actual* law. innocent until proven guilty right? as far as i'm aware i can have any number of stickers affixed to the outside or inside of my vehicle at any time. this is absolute bs. So bad things happens to people, but you only have sympathy for them if they didn't "deserve" it according to the DC tax code. That's a pretty fucked up code of ethics. Anon @ 1:08, who are you referring to? Just remove the ticket. Then snap a photo of the window without the old one and just the new one. Then dispute the ticket and send it in. It will be up to the government to provide evidence that the second ticket was there. So unless the ticket person brought along a camera, you win. I win every time this way. The D.C. government is not properly prepared. All bark, no bite. I also got one and thought it was pretty ridiculous. I looked at the regs and found that, while it is not spefically listed as a requirement (i.e. removing the expired sticker) it is listed in the schedule of fines associated with parking violations. Yes, I received a smiliar ticket last week, as well. I aplied for my renewal, and since my current renewal would expire before the new sticker arrived, I was issued a temporary placard to print andd put in my window. There was no mention that I should remove the expired sticker. I placed the small placard right next to the sticker. I received the fine. I just received one, too. I am going to contest it, however, as I had my temporary placard placed on the dash by the expired sticker -- which they explicitly said must be done, and that the sticker must NOT be removed until the new one arrived. Would you buy produce at 7-Eleven? What's up at BloomBars in the coming week? One way traffic sign turned into "bone away"
Wanna buy the Park Triangle on the Civic Plaza? Do you have tips for a new resident?